One of the absolute highlights of 2017 was trekking into the Ugandan jungle to hang out with gorillas. We had originally planned to see the gorillas in Rwanda, but a few months before our trip the Rwandan government doubled the price of the permit. Literally doubled. Overnight. So to Uganda it was! It cost $US694. I was actually pretty nervous, part of me was convinced one of these huge primates might freak out and eat my face off. But they didn’t! Just as everyone had told me, the gorillas actually couldn’t care less that we were standing just a few short metres away. But first things first. We got a taxi from Kigali, Rwanda’s capital, to the Ugandan border which took about two hours. We, being my dad, Andy, my aunt Jo and I, then walked across the border. I got held up because the immigration officer noticed I’d been to Tanzania, effectively voiding my East African Visa which covers Kenya, Uganda and Rwanda. He had to check this with many people and I think I developed at least three grey hairs while he disappeared with my passport for 20 minutes. I ended up having to buy a Ugandan visa for $US40 which was annoying because I was only there for 24 hours and Andy had made it through with no problems. But I digress. On the Ugandan side we were picked up by Prime Safaris and dropped at the Lake Bunyonyi Rock Resort. 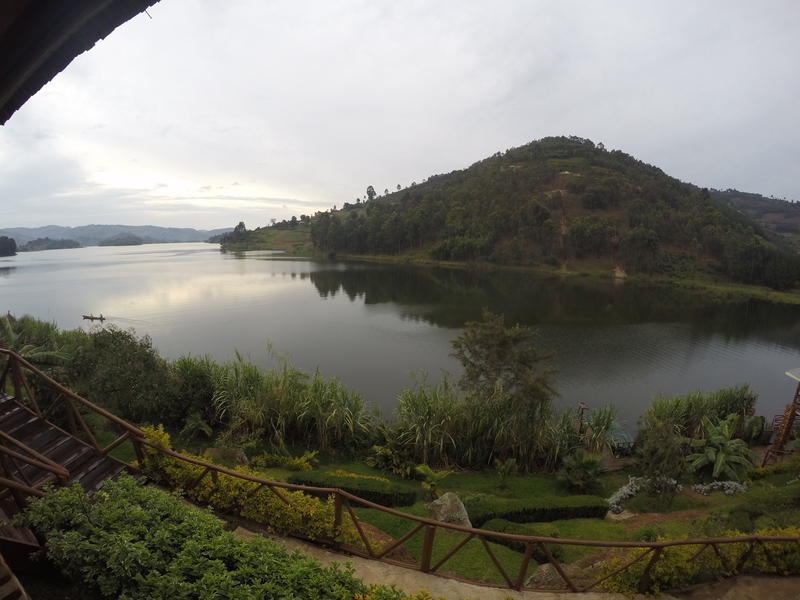 Lake Bunyonyi is a beautiful, extremely deep lake with a murky past. Some of the islands in the lake were previously used as prisons or ‘colonies’ for unwed pregnant girls and people with leprosy. Nowadays it’s slowly emerging as a tourist destination. It was absolutely beautiful. We took a swim and had a ridiculously huge dinner. The next morning we left at the crack of dawn to drive to the Bwindi Impenetrable Forest for our trek with Prime Safaris. There are trackers who keep up with the location of the gorilla families. You can choose a short trek or a long trek and then your guides take you in the directions of the trackers who connect you with the family. We opted for a short trek and after 45 minutes of hiking along a track we’d reached the point where we started bush bashing uphill to see the gorillas. Side note: one of our trackers was a woman, the only one in the job in Uganda! We climbed over tree roots, under branches and thick vines and eventually we stopped and heard the thundering sound of a gorilla moving quickly downhill towards us before hitting a nearby bush and shaking the leaves. A few seconds later he rolled downhill right in front of us. It was such a comical way of moving we couldn’t help but laugh. We followed them, encouraged by the trackers to get close (the 7 metre distance rule they talked about was completely forgotten!) and have a good look. The way the moved their hands was so humanlike it was mesmerising. As I mentioned, they are so accustomed to humans they couldn’t care less about your presence. They look right at you. I took thousands of photos but I didn’t want to bore you with all of them! There are only 880 mountain gorillas left in the wild, so if you can visit a few I highly recommend it. This was absolutely one of my top travel experiences ever and well worth the cost and effort to get there. This entry was posted in Travel and tagged Africa, East Africa, Gorilla Trek, Safari, Travel, Uganda. Bookmark the permalink. Amazing! This is something I’d love to do! So what’s the deal with the visa problem? Do you think it would be an issue if you went to Tanzania first anf then ibto Uganda? Sorry I didn’t explain this very well! The East African tourist visa allows entry into Kenya, Rwanda and Uganda. I bought one of these visas on arrival in Kenya, then went to Tanzania, then Rwanda, then Uganda. I assumed because I had this visa I would not need to buy one in Uganda. But if you go outside these three countries (ie to Tanzania) in between in actually cancels the East African tourist visa! Nuts! And they didn’t pick it up at the Rwandan border (luckily). So that’s why I needed to buy a Ugandan visa on top of this. Hope that makes sense! No WAY!!! This is so amazing and brave! Nice work. Love the photos! !